MTI’s 1510A portable signal generator and calibrator is ideal for testing the integrity of sensor signal conditioning electronics. 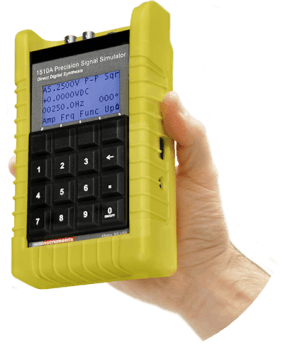 This battery operated function generator is encased in a sturdy high visibility shell with a spill-proof keypad. It can be used in the laboratory, field, or factory floor with the purpose of mimicking sensor signals. It mimics eddy current, accelerometer, strain gauge and other types of triangle, sinusoidal, pulse or digital pulse trains. The frequency response of the ensuing signal conditioning devices is analyzed by the sweep function. A USB port enables remote control and programming of the unit. Users can program this signal source generator so as to produce two autonomous or synchronized signals of different standard signal waveforms (SQUARE, SINE, PULSE, and TRIANGLE) and diverse frequencies up to 100 kHz. A Channel B delivers speed synthesizer signal functionalities such as sweep function, odd pulse and single pulse. The 1510A is designed to handle cabling and wiring troubleshooting, machinery speed signal simulation, low-voltage bridge mode (microvolt DC output) sensor signal simulation, audio signal simulation and gas turbine maintenance. It can produce precise and accurate charge, voltage and speed signals crucial for system troubleshooting, testing and calibration. 7500-7522 Software Software allows users to preprogram the 1510A memory and to control the 1510A via the included USB remote control cable. 6000-4007 Single-ended Charge Output Adapter Cable 5 foot low-noise cable with micro-dot connectors feeds single ended signals from the 1510A to charge amplifier, or other instruments.